If anyone is looking for MREs, my suggestion is to hit eBay: You'll find a lot of full packaged official MRE meals. Cases, individuals, pieces, etc. too. Fairly cheap if you keep your eye out long enough. That's where I got mine for Pine Plains. New Blue Force Gear 10 Speed Chest Rig. I gave 10SPD a try and eneded up returning the pouches. Let me know how the CR turns out. How well does the velcro backed molle straps hold up? 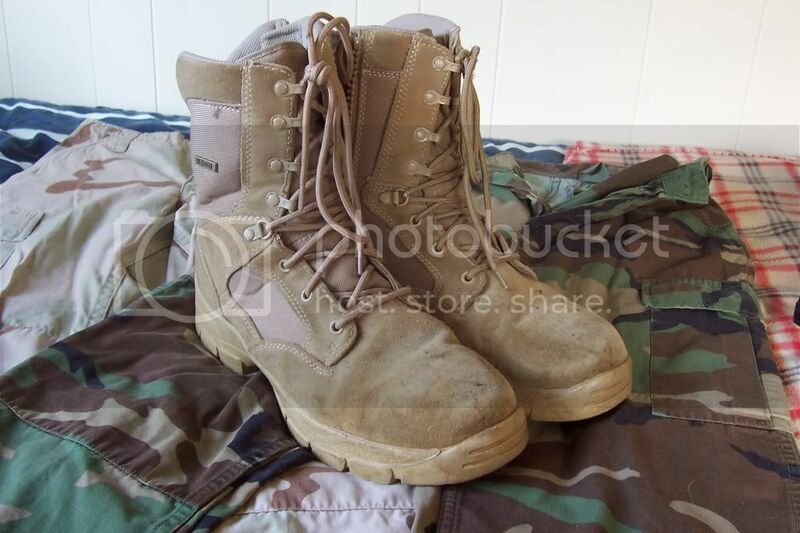 Recently got a pair of generic tan boots, not too special. Also got an IBH to replace my MICH. Ignore the cat eyes band, it was on there as a joke and I forgot to take it off. Used it in a small game the other day. Worked great for it's intended purpose; extremely low profile, very light (8.7oz), easy to store (rolls up into a ball just bigger than a soft ball), and it can hold the absolute necessities minus water, which can be supplied in a hydro. It'll be perfect for games I ride to. Got some new patches because everyone likes patches. 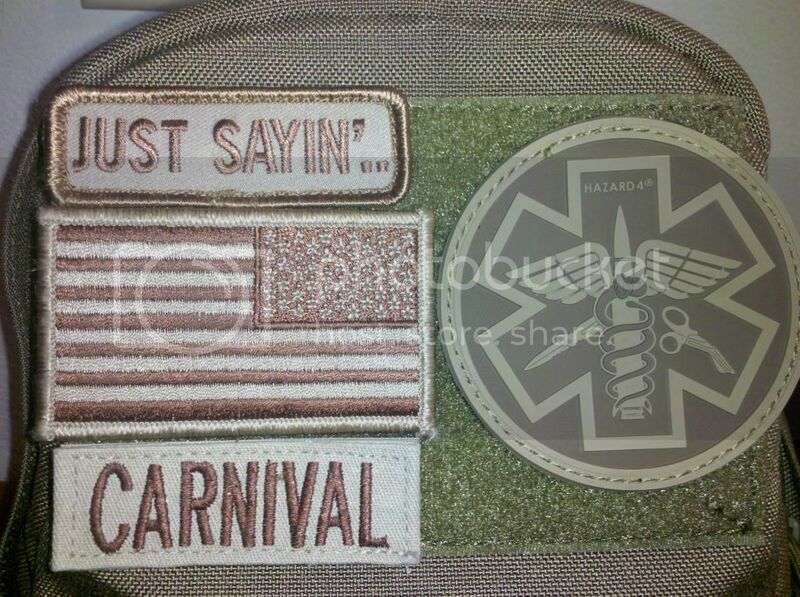 A Medic Patch by Hazard 4 off of amazon. Looks cool but took them 3 weeks to get a response from them. Last edited by Carnival; 05-17-2011 at 09:28 PM. I got a king arms 11.1 15C lipo and a wierd little blue brick battery charger for it. I cant figure the charger or charge time out. But But But But But you have a glock 17? yup that truely is a great gun hope you love it as much as i did. Last edited by slim. ; 05-25-2011 at 07:15 PM. I wanna start my RRS-V so bad Your new stuff looks great! 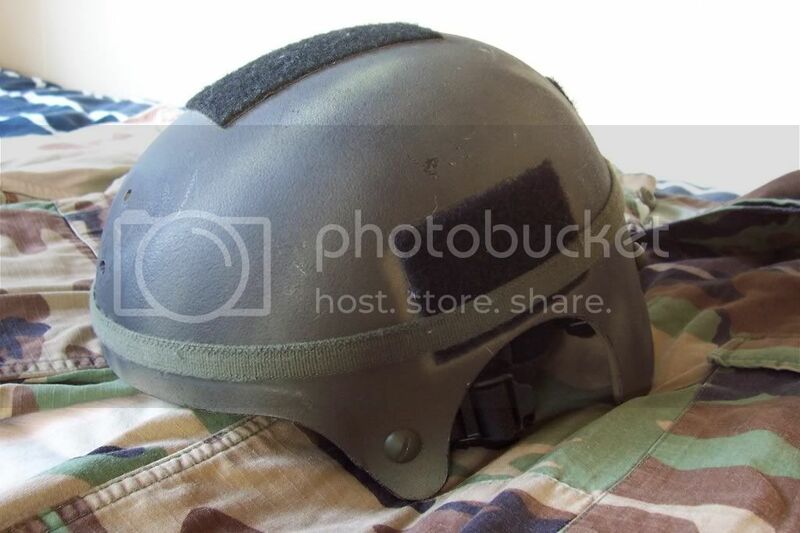 Yeah, I'm looking for a EI one, but I'm having trouble finding one in Khaki for a decent price. Anyone want to sell theirs? From the little bit that I've worn it, I like it. I sat down at the computer with it on and didn't even notice it. When the belt is taught, the buckle 'folds' pretty flat, too. Also, the triangle buckle is for a retention lanyard, right? Last edited by Italian; 05-25-2011 at 07:29 PM. Negative. Its for emergency rappelling if you don't have an actual rig. Actually, there are some instances where they are used for a PRL.